Lekker [ˈlɛkər]: is the Dutch adjective for literally everything that is good, delicious or fun. And that is what we are all about! Whether you want a 'lekker' ride in a vintage Fiat 500 along the canals or enjoy a 'lekker' afternoon with the Volkswagen T2 by the sea, we got it. All tours include our signature chocolate tasting that is both fun, educational and very very 'lekker'. 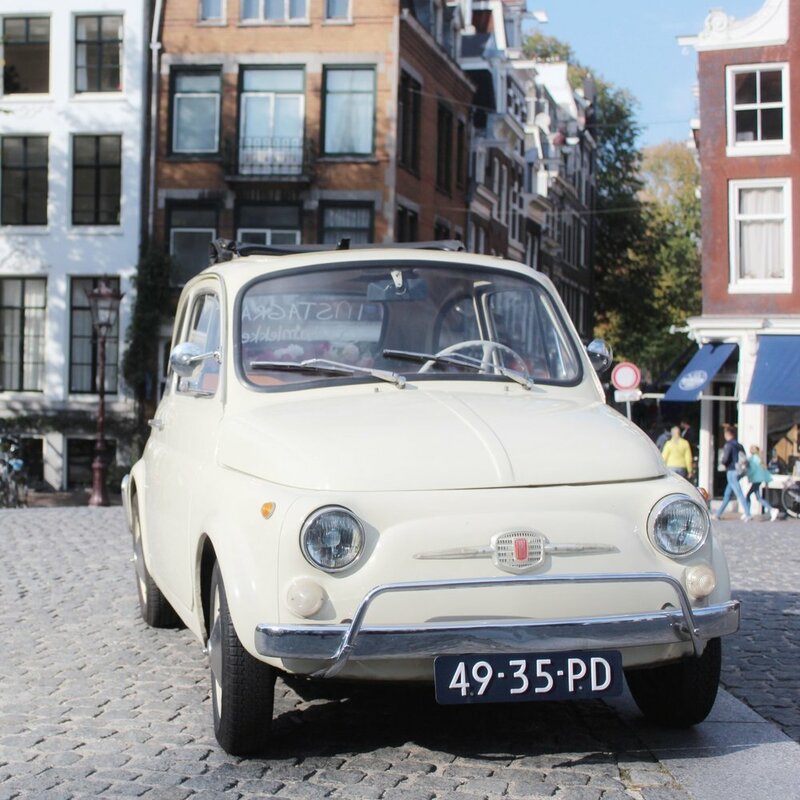 During this unique tour, we will personally drive you around Amsterdam in our vintage Fiat 500 from 1971. A true eye catcher and the cutest car you've ever seen! The theme of this tour is chocolate. As a chocolate makers and lovers, we will share everything we know about this widely loved delicasy. The history of chocolates, where it's grown and how it's made. Take a deeper dive into the world of chocolate! There’s nothing more charming than historic windmills with a typical Dutch countryside view. Besides tulips and cheese (& chocolate! ), the Netherlands has some of the most picturesque countryside landscapes that can not be found anywhere else in the world. We take you to the most beautiful old windmills around Amsterdam and top it off with a visit to a typical Dutch town. Of course fine chocolate tastings cannot be missed during this tour and we will drive along the little rivers with windmills lined up in our vintage Volkswagen van. Flowers and vintage cars, another one of our favorite combinations. Do you wish to see the astonishing beauty of Dutch flowers, while enjoying a mellow, intimate group setting? Join us to the Keukenhof in spring, driving there in our Volkswagen T2! Taking pictures in the famous flower fields and picking your own bouquet in a private flower garden are also part of the package. We round it up with one of our signature chocolate tastings. If you feel like getting out of the city and exploring the Dutch seaside, this tour is for you! In retro beach style, with our Volkswagen bus we hit the road to the salty sea and refreshing dunes. The theme of this tour is discovering the beauty of Dutch nature and enjoying a deluxe high tea with chocolate tasting. This tour is very special to us, as it combines our favorite things; chocolate and nature. Come enjoy the Dutch dunes and beach who are one of a kind, unspoiled and off the beaten track.